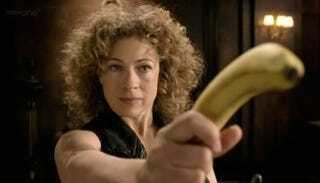 River Song Is Returning to Doctor Who. Great. Whee. River Song will return to sass the Doctor in this year’s Doctor Who Christmas Special, according to the BBC. It’s like a Christmas present, except you can’t leave it under the tree and you can’t regift it later. Sorry, I’m still burned out on River Song. Her increasingly convoluted saga with Matt Smith’s Eleventh Doctor was way too long, and even though it’s been 14 episodes (series 8 and two specials) since we’ve seen her, it still feels like she was just here, completely hijacking the series’ narrative. The easy answer is that being a time-traveler herself, River could just be showing up in the middle of her life, with no knowledge of her eventual death. But when did a River Song storyline ever choose the easy answer? There is a plus side here, and that’s basically Peter Capaldi. More than any other incarnation, I have to think the already sassy Twelfth Doctor can go toe-to-toe with the sassy River Song. Also, I feel like the two characters should have a brilliant chemistry Kingston and Smith’s Eleventh Doctor lacked. Basically, if River Song has to come crashing into another Doctor’s life, I’m very glad it’s this one.